The British Gazette » Comfort ye, comfort ye my people, saith your God. Speak ye comfortably to Jerusalem…..
Today’s article has been published on the second Sunday in Advent when the Anglican Lectionary has Isaiah 40 as one of the texts. When President Trump announced that the USA would be relocating it’s embassy from Tel Aviv to Jerusalem on Wednesday, 6th December 2017, he chose an auspicious date; Saint Nicholas’ Day. Saint Nicholas’ Day, is observed on 6th December in Western Christian countries and Romania, on 5th December in the Netherlands and on 19th December in Eastern Christian countries. It is celebrated as a Christian festival with particular regard to his reputation as a bringer of gifts. The word gift is most apposite here. To mean something, a gift must have value. That value need not be material, but often is. This is a worthless gift, so much so it cannot properly be described as such. Apart from the physical effort required to pick up and present the leaf, the act has involved no cost to the giver. What the Feast Day of St. Nicholas is about is charity: helping others. That means giving of yourself. So charity is synonymous with selflessness. There is no doubt that the US government has undertaken a selfless act in recognising Jerusalem as the “de jure” capital of Israel was well as the “de facto” capital. This is because many US businesses will find themselves disadvantaged by this. You see, there are several countries in the world with large Muslim populations: Pakistan and Indonesia being the most prominent. Then there are several Muslin countries who, although not having large populations, have an enormous GNI: Saudi Arabia being the most prominent. These US businesses will naturally be concerned at the consequences in terms of loss of business to other non US competitors. As a businessman himself, this is something that President Trump will have been aware of. This cost to “business” and other costs, is one of the reasons why European countries have not followed the US example. Another reason is that many such countries, most notably, Belgium, France and Germany – and the UK – have large Muslim populations who have the vote. Of course there is a particular reason why the UK government would not have followed the US example and in fact criticised it: the plight of Mrs Nazanin Zaghari-Ratcliffe. Of course, the public reason for not following the US example was that the recognition of Jerusalem as Israel’s capital must form part of a final peace settlement with the “Palestinians”. Let us now face a FACT: The prospect of a peaceful settlement where the Palestinians agree to live in peace with their Jewish neighbours, makes Henry Bolton’s belief that the UK can walk away from the Article 50 negotiations, announce it has left [the EU] and economic and logistical chaos will NOT follow look a sensible practical strategy! Of course, all the foreign ministries of the European countries KNOW THIS! But they persist in promoting this fantasy because they perceive (correctly) that it is their material interests to do so. The insolvable problem facing diplomats seeking to settle the Israel/Palestine issue is this: There is no prospect that a Palestinian state on the East Bank with it’s capital in East Jerusalem could be a stable entity capable of preventing “extremists” taking “direct action” against what they perceive to be “Zionist targets”. At the most basic level, a peaceful settlement requires peace! In other words, the Palestinians cannot deliver this. If we look elsewhere in time and space we can cite other examples where one side would never have been able to deliver. If we look to our own history: King James II. King James II was a Roman Catholic and more than likely wanted to see Roman Catholicism revert as the state religion. However, he espoused “toleration” – the revolutionary idea (at that time) that Roman Catholics and Protestants should co-operate – as they do today. But English society in 1688 was very different to what it is today. Religious tolerance did not exist. One either was an adherent to the “True faith” or you weren’t. If you weren’t you were a heretic and damned and your earthly existence was ended – brutally! This extreme bigotry is seen today as the recent murders of Muslims by Muslims in Egypt demonstrate. Recently in Scotland there was a case of a Muslim shopkeeper murdered by another Muslim for the same reason. Now of course, not every person in England in 1688 would actively have partaken in the torture and killing of those of a different faith. However, sufficient numbers supported, condoned and did not oppose such as to make 21st Century style ecumenicism impossible. Now, let is suppose, for the sake of argument, every Jewish person in Israel –Benjamin Netanyahu included – decided en masse, that the game was up and every Jewish person would emigrate from Israel to the USA and the USA agreed to this and the Palestinians agreed and what was the state of Israel became the State of Palestine and no Jewish person lived there. 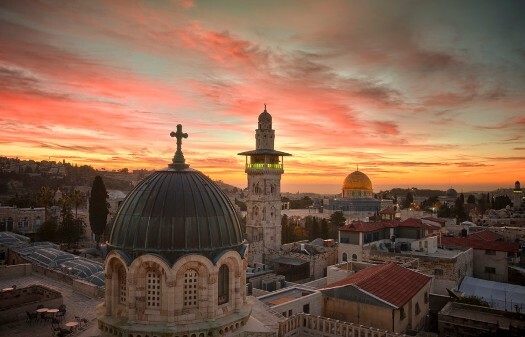 Question: Today, Jerusalem and Bethlehem have a thriving tourist industry with many Christians visiting sites they deem sacred. For how long would this state of affairs persist in an exclusively Muslim Palestine? Answer: For a limited period. Muslim extremists would deem such as the Church of the Holy Sepulchre as heretical places and like the ancient ruins of Palmyra in Syria be razed to the ground. Again, this is not exclusively a Muslim phenomenon. If one goes to Wells cathedral in Somerset one thing you will NOT see thanks to 17th Century Puritans is the magnificent facade decorated with statuary. This magnificent artwork – which would now be deemed a World Heritage Site had it been not been smashed to pieces – is no longer. These Puritans deemed this to be heretical and therefore had to be destroyed. Here is a FACT: You could not have argued and have persuaded these bigots out of their decision to destroy this artwork. Had you attempted to do so they would have deemed you a heretic and probably have killed you. The differences between these long dead Britons and those Britons who volunteered to go to Syria and fight for “IS” is that the former lived in the 17th Century and were Christians and the latter live/lived in the 21st Century and are/were Muslims. The ONE other thing these two sets of bigots have in common is that they BOTH regard people who are atheists as being “beyond the pale” and should be murdered – or as they would see it, an execution sanctioned by God! British Gazette comment: In William Tyndale’s English translation of the New Testament (1526) it states: “I testifie therfore before god and before the lorde Iesu Christ which shall iudge quicke and deed at his aperynge in his kyngdom” [2 Timothy 4:1]. This was used by Thomas Cranmer in his translation of the Nicene Creed and Apostles’ Creed for the first Book of Common Prayer (1540). The use of the word quick in this context is an archaic one. Here, the word specifically means living or alive – a meaning still retained in the “quick” of the fingernails, and in the idiom quickening, being the moment in pregnancy when a mother first first feels her baby’s foetal movements. The logical interpretation of this is that the event referred to is a singular event. Given that time does not exist in the hereafter, logic would suggest that “the dead” and those alive would be “dealt with” at the same time. Therefore we suggest that these long dead and living bigots could quite literally be in for a Hell of a shock!